The daughter of the king of the ocean, Ponyo is no ordinary goldfish – she has all the magic of the sea at her disposal. 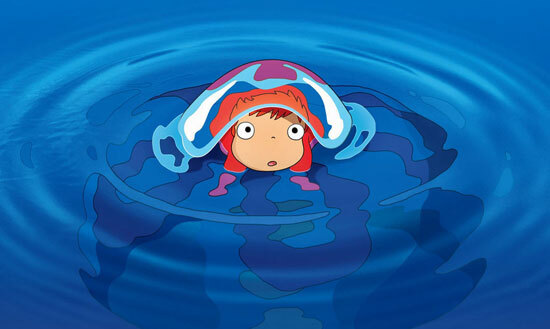 But when five-year-old Sosuke finds her near his seaside home, a special connection sparks between them and Ponyo becomes determined to become human. Transforming into a little girl, Ponyo shows up on Sosuke’s doorstep, delighted to make herself at home with her new land-dwelling family. However, her magical powers confined to the Earth begin setting the mystical balance of the world off kilter, and even though the innocent love Ponyo feels for her friend is strong, it will take some help from the greatest powers in the ocean to make things right again. A beautiful animated film from Japan’s Studio Ghibli, we will be screening the dubbed version for those wee uns who can’t read subtitles.